Dave Bonta takes a moment to ponder about beer history and how hopped beer came to replace gruited ale in Europe. 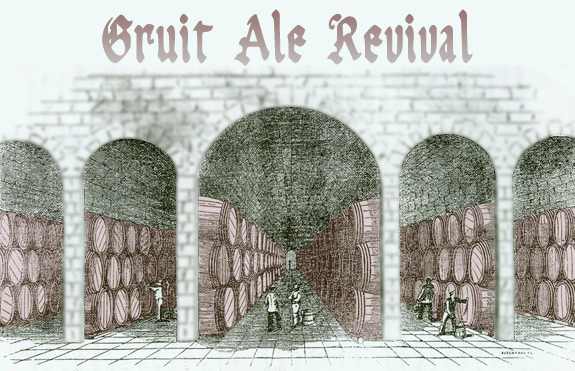 What was gruit? 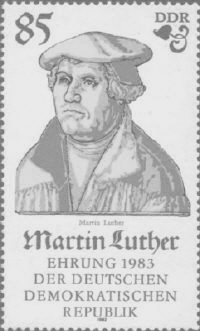 How does the Lutherian temperance movement link to gruit ale being toppled by Hops? Read on. Why brew at home? If you’re perfectly satisfied with the taste of Budweiser or Coors, you’re not going to save any money by trying to reproduce their stuff in your own kitchen (1). Moreover, unless you’re a fanatic for detail and cleanliness, you may not have a whole lot of luck reproducing more exotic or specialized beers, either. And if you haven’t noticed, the culture of homebrewing in the United States today is overwhelmingly male and techie. If math is a turn-off for you as it is for me, you probably won’t fit in. There’s a strong aesthetic dimension to homebrewing: it’s more like alchemy than chemistry. Anyone who likes to cook will love to brew. But more than that, for me it’s a way of connecting with my Northern European ancestors. Brewing ales and making meads was (and is) a highly developed art, something Europeans did that is truly worth celebrating. It’s a tradition with submerged elements of pre-Christian religious practice that add to my appreciation and sense of connection with pagan roots, though I have no urge to try and recreate those elements in any precise form. Actually, that’s not really possible–too much has been lost. 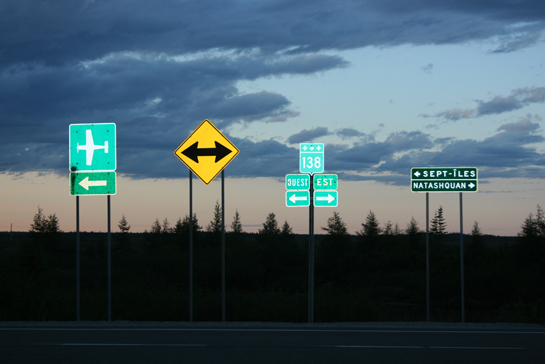 What we’re left with is mostly educated guesswork. Most gruit recipes were closely held secrets that were passed down in families or jealously guarded by monasteries, and very few authentic formulas have survived. That’s why, for me, it’s so much fun to play around with gruits. So what’s a gruit? Simply stated, it’s a blend of herbs that traditional brewers added to their beer in Renaissance times and before. Herbs are essential ingredients in beer, both as preservatives and to counterbalance the otherwise cloying taste of malt. You may hear such herbs referred to as hop substitutes, but that’s historically inaccurate. Hops are a gruit substitute. You don’t need hops to make beer, but you do need something–or else plan to drink it immediately, before it can spoil (see discussion of small ale, below). But what’s wrong with hops? Nothing, if you need help going to sleep, going to the bathroom or going through menopause. Hops are a strong sedative, a good diuretic and an estrogen substitute. If you’re a guy, however, you should be aware of a well-documented but under-reported phenomenon known as Brewer’s Droop. In technical terms, hops are a strong anaphrodisiac for men. Some otherwise fairly reliable sources of information on brewing with herbs claim that hops came into use because of their superior antiseptic properties. Reference to a good herbal should quickly dispel this notion (3). In general, any herb with strong bittering qualities is also a reliable antiseptic: common examples include yarrow, wormwood, mugwort, sage, heather, oak bark, dandelion roots or leaves, juniper berries and branches, nettles, yarrow, ground ivy (a.k.a. alehoof) and many more. The story of how hopped beer came to replace gruited ale is a complex and convoluted one, with origins in both the Protestant Reformation and the Industrial Revolution. 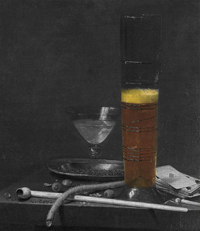 An anti-gruit campaign, similar in scope and absurdity to our contemporary War On Drugs, fed off the anti-clerical and anti-pleasure hysteria of the Protestant Reformation, and coincided with the violent persecution of herbalists as witches and herbs as dangerous substitutes for “scientific” medicine in the sixteenth and seventeenth centuries. It didn’t help that gruit blends in many parts of northern Europe were exclusive monopolies of the Church. 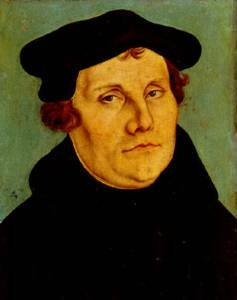 All brewers in those areas were forced to purchase their gruits from specially licensed monastic houses at highly inflated prices, which probably did more to enflame anti-clerical feelings than anything Martin Luther ever said. 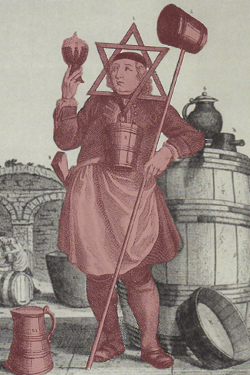 It’s also important to remember that most brewers throughout the Middle Ages and into the Renaissance were women. In England, at least, the competition between “modern” beer brewers and makers of old-fashioned ale took on aspects of a war between the sexes, though it was also about urban vs. rural and large-scale vs. small-scale production. Studies of tax records from the period suggest that, in more rural areas, the vast majority of commercially produced gruit ale was made by part-time brewsters or “alewives”–female homebrewers who sold their surplus ale, typically advertising a new batch by sticking a broom out the window. As long as brewing remained a minor, local activity–a source of seasonal, supplemental income for farmers’ and tradesmen’s wives–nobody cared. But when it became obvious that there was serious money to be made, men began elbowing in. The fact that hopped German “bier” was exempted from the regulations protecting the brewsters’ guilds simply provided the fulcrum. A vicious propaganda campaign stereotyped alewives as filthy, slatternly cheats who never missed a chance to adulterate their brew. 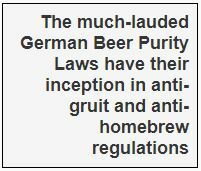 The much-lauded German Beer Purity Laws have their inception in anti-gruit and anti-homebrew regulations of this period, and formed part of the same irrational phobia toward the (darker) Other that culminated in the Nazi holocaust. To this day, many beer purists insist that any addition of non-grain-derived sugars–much less herbs and spices–makes a brew fit only for the ignorant, unwashed masses. And of course the wave of Protestant-instigated intolerance peaked in the temperance movement of the late 19th and early 20th centuries. The resulting prohibitions were the nail in the coffin for most local brewing traditions. Nowhere was the intolerance as strong as in the Prohibition-era United States; our modern centralized, homogenized corporate brewing landscape is the result. Fortunately, the tradition of homebrewing was never completely eradicated from the farmstead, especially in the more remote corners of Scotland (where heather ale was the persecuted national drink) and in parts of Scandinavia. But on this side of the Atlantic, contemporary homebrewers have learned (or relearned) quite a bit since the days of Prohibition, when exploding bottles and “off” batches were regarded as normal, occupational hazards of brewing at home. There’s no simple explanation for why hops won the war in Britain, where malting and ale-brewing traditions were so elaborated and so firmly entrenched in the culture. I suspect that the sedative properties of hopped beer were a big part of the answer, however. Working people had long been in the habit of drinking weak ale–“small drink” in the parlance of the day–from the second running of the grain (4). The prolonged boiling meant it was much safer to drink than water. Alcohol content typically ranged from 1-3%, and given the heavy grain bills common with less efficiently sprouted malt, this weak ale would have been highly nutritious–a major source of B vitamins, among other things. German-style hopped beer was introduced specifically to fill that niche. (Coffee and tea came in a little later. The British tradition of High Tea is simply a transmogrified version of the peasant’s traditional, ale-centered supper.) The big operations of these urban, male brewers made them the natural choice for supplying the rapidly growing English navy in the 16th and 17th centuries. And it’s my feeling that the much longer hours and unprecedented drudgery imposed upon the industrializing workforce would’ve proved intolerable without a cheap, readily available, state-supported sedative. In any event, the near-total loss of homebrewing traditions, including the making of gruits, coincided with the destruction of rural life by the Enclosure Acts and the Industrial Revolution. Gruited ale made from the first running of the grain was (and is) a very different drink from the day-to-day small ale. The latter was quickly consumed, so it didn’t matter if it was unstable. But the “real ale,” as they called it, was designed to hold up in the cellar a good, long time (hence the higher alcohol content) and served a wholly different purpose–promoting gaiety at multi-day, village-wide events such as weddings or patron saints’ festivals. Depending on the district, it might have been made by the larger brewsters, by the breweries attached to aristocratic households, and/or by monasteries. The important point is that the Mediaeval and Renaissance calendar was liberally peppered with holidays; before the Industrial Revolution, roughly a quarter of the year was given over to festivals of one sort or another. For most of these occasions, celebrants needed a drink that would keep them awake and energetic. Many of the popular gruit herbs helped do this. In addition, some of these herbs had religious connotations that survived the switch from pre-Christian to Christian practices. Sweet flag or calamus, for instance, provided both a mildly euphorogenic gruit ingredient (the roots) and a popular, aromatic floor covering for churches on festive occasions (the rush-like leaves). Tansy was sacred to the Virgin, and angelica–as its name suggests–evoked the power of the archangel, St. Michael. In the vitalistic worldview of pre-modern Europeans, plants were credited with distinct personalities and powers. For example, sage–its English name a corruption of the Latin salvia–was thought to have salvific properties, both literal and figurative. The sage plants in one’s garden were regarded as talismans and totems of a sort, whose fortunes would wane or grow with their owners’. The powerful women’s herb rue was used in spells to ward off black magic and bestow second sight. Its use in gruit formulas was probably more common than contemporary records admit, since such a strong ally against the spoiling of ale (often attributed to witchcraft) would work best as a covert agent. The name of St. John’s wort reflects a similar belief about that herb. Curiously, while modern researchers have substantiated its strong anti-depressant properties, they’ve also found that people who take St. John’s wort should avoid direct sunlight, or else they can suffer from a mild form of poisoning. Nothing could be more emblematic of the mysterious, ambivalent power of gruit herbs! What does all this mean for the homebrewer? Above all, it provides an outlet for the experimental impulse. Even if more gruit recipes HAD been preserved, they might not have been much help: medieval recipes were gloriously imprecise. Also, herbs can vary greatly in strength depending on when and how they are harvested, how old they are, what part of the tree or plant they’re from, etc. I’m personally not very interested in trying to recreate historical recipes, though if I were brewing in quantity for a big celebration I’d probably give some of the surviving guidelines a bit more attention. I mostly brew for my own use and for a few guests and friends, so the typical American pattern of bottled 5-gallon batches suits me fine. I do, however, appreciate the convenience of being able to get a decent buzz off of one 16-oz. bottle, and I really like strong, earthy tastes. A local source of really good (and cheap) wildflower honey has helped convince me of the wisdom of adding a pound or two of honey to every batch of ale. Honey has antimicrobial properties of its own, and adds a great deal not just to the alcohol content but to the quality and duration of the buzz. And the herbs make the kitchen smell even more wonderful than the malt alone. If you’ve never brewed, there’s never been a better time to start. With the help of the internet, you can locate cheap supplies and all sorts of exotic ingredients that might’ve taken months to hunt down just a few years ago. If you’re already a homebrewer, congratulations. It’s legions of American homebrewers who, over the last 30 years, have made the microbrew revolution possible. But the revolution, like all good parties, isn’t over in just one night. Take the next step. Go gruit! (1) There are, of course, sound political and ethical reasons for not supporting repressive and homogenizing mega-corporations, but those really add up to an argument for supporting your local microbrewery–an increasingly viable option even for those of us out in the sticks. The beers they typically produce may seem weird or different, but remember: your great-grandparents drank stuff just like it. At least, whenever the corn crop failed. (2) That’s “neutralize,” not “eliminate.” Don’t be a fascist! The goal of the homebrewer–as even the clean freak Charlie Papazian stresses–is SANITATION, not complete sterility. And consider: bacteria and wild yeasts play an important role in some of the most prized and exotic styles. Why should you deny yourself the chance to brew beers that are just as strange? Nothing that can live in alcohol can kill you. (Accidental methanol production is only a concern for distillers.) The one type of bacteria you absolutely DON’T want is the stuff that wants to turn your brew into vinegar. Though some of the other strains can do annoying things, as well, like blow up bottles. Or worse, make your beer taste like wine. So keep it clean, kick up the alcohol content, and don’t stint on the mugwort! (3) Good old Maude Grieve even gives some gruit formulas in her section on hops! The whole of her classic Modern Herbal is now available for free on line, too, though at $22.00 for the 2-volume set from Dover, you ought to consider just coughing up the dough. It makes great bedtime reading. (4) For the benefit of non-brewers: alcohol is obtained by feeding sugar to yeast. In beer or ale, that sugar comes largely from grains, most of which must first be malted–sprouted for a couple days until they start to swell, then dried or roasted for storage. The soul of the brewer’s art lies not in the fermentation–even vintners can manage that–but in the conversion of starches in the malted grain to sugar. Before thermometers, especially, this was a highly arcane affair. But in essence one maintains a sort of porridge–the mash–at certain temperatures for varying lengths of time, then drains off the sugar-laden water: the first running. 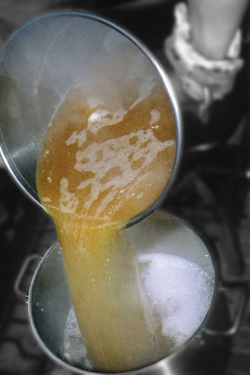 In modern practice, one then rinses the remaining sugar from the grains with additional, boiling water–the sparge–and adds that to the mash. But in the old days, a larger quantity of hot water would be used to steep the grains a second time. This would then be drained off for the second running, which would be made into a wholly separate, weaker brew. Sometimes, however, the brewster would add honey to the second runnings to make a strong, mead-ale hybrid called a braggot. And occasionally a very weak third running would also be drawn off. Gruit can be understood in a historically precise sense, but also in a larger view: when Hops are optional, call it Gruit Ale. Before beer, it was Gruit. 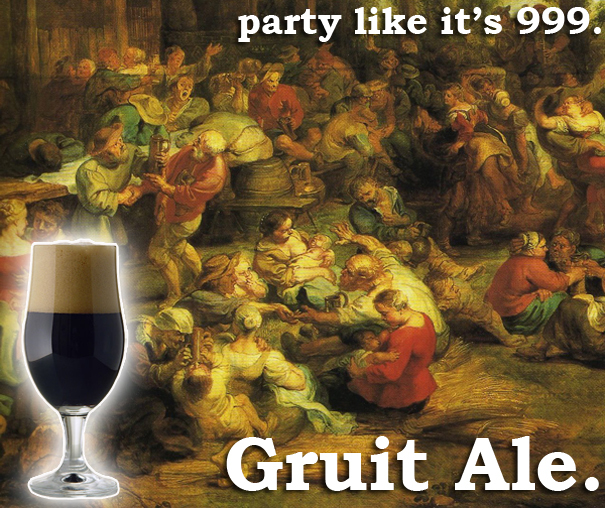 For more than 700 years, Gruit Ale was the brewed beverage of medieval Europe. Like today’s beer, it was brewed with water, cereal grain and yeast. Unlike today’s beer, it was spiced with any number of over 60 plants in herbs, roots and spices form. 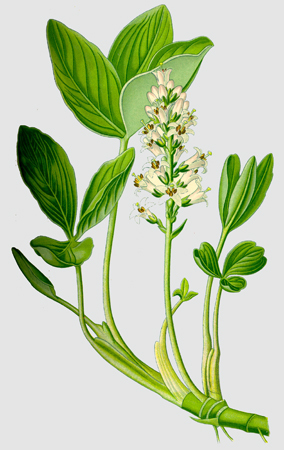 The Hop, which is now the quintessential aromatic and bittering herb of our contemporary beers, was before but one of many herbs sometimes used by brewers in their recipes. Hops were often completely unknown in some brewing areas of Europe. 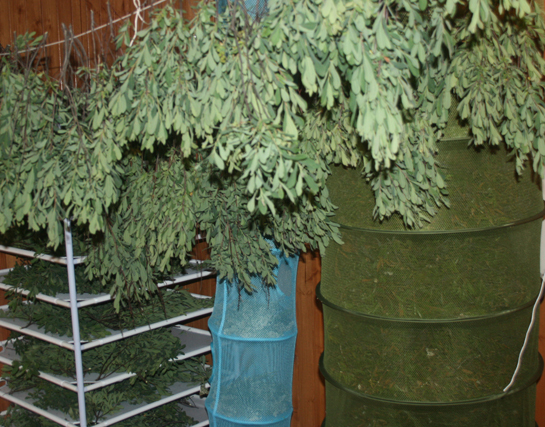 Instead, brewers relied on a healthy collection of herbs. This was Gruit Ale. 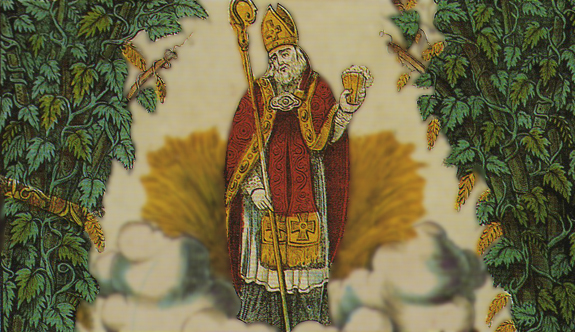 It has a fascinating history: centuries of consumption, Gruit recipes and taxes were controlled by Church operated monopolies, followed by an ideological and mercantile competition with the Hop which resulted in the Prohibition of Gruit and its eventual downfall. Today, Gruit is making a comeback. Brewers are slowly realizing that although Hops is a delicious herbal addition to beer, it has its fair share of down sides. As with any brewed herb, Hops conveys a number of qualities to the beer we drink. It helps to preserve the brew, gives it a delicate bouquet and delicious bitter taste – but it also causes drowsiness and diminishes sexual desire. Gruit Ale, with its herbs, roots and spices not only convey varied taste and flavor to a brew, but also a myriad of medicinal and psychotropic qualities. If we’re to remember anything at all from our brewing and beer loving ancestors, it’s that choice ingredients play a defining part in the way beer makes us feel. To the attentive mind, all plants are psychotropic; they all change consciousness, awareness, understanding, and sense of self. Hops do. But so does Yarrow, Rosemary, Sweet gale, Juniper, Licorice, Wormwood, Chamomile, Mugwort, Cardamom seeds, and countless others. A bove all else, Gruit Ale is about thinking beer outside the cone… the monolithic Hops cone. 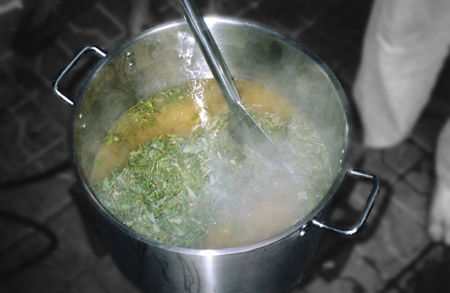 Why should we limit ourselves to one single brewing herb? Gruit is an open window on a forgotten brewing tradition which inspires renewed brewing possibilities. And isn’t that what craft brewing is all about? 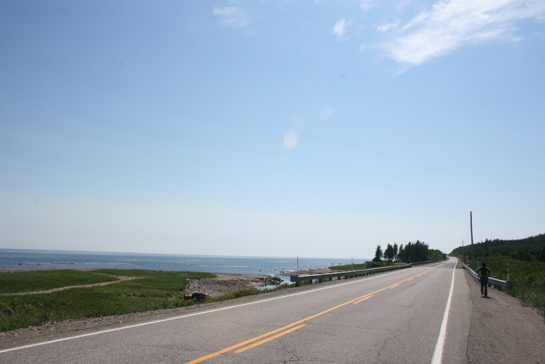 In the summer of 2010, my wife and I headed for a 14 hour drive North of our home in Montréal to reach the Basse Côte Nord region. The search for the Holy Gruit Herbs had begun. The Gruit Harvest was made near the 50th paralell. of the overlapping biomes, tundra and taiga. 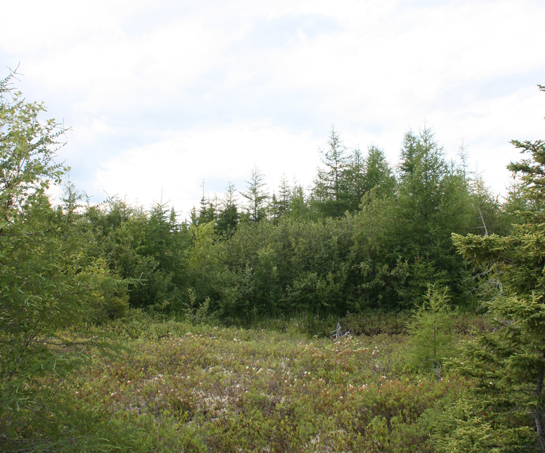 Canadian Shield bog. 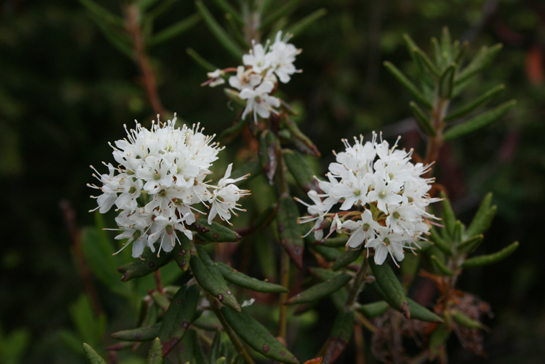 Labrador Tea grows numerous here but no higher than 2 feet. 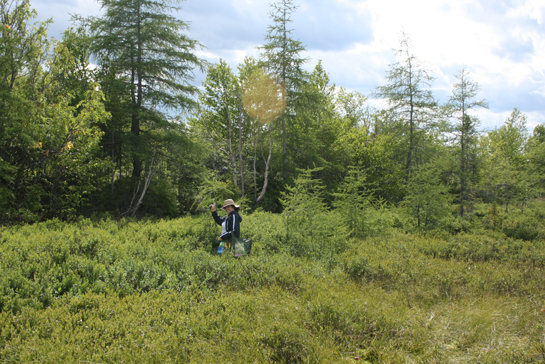 Many of the small plants on the foreground are Labrador tea. My wife harvesting Sweet Gale like a trooper, in ancle deep bog water. Myrica gale thrives in bushes. of rusting after surviving the harsh winter. 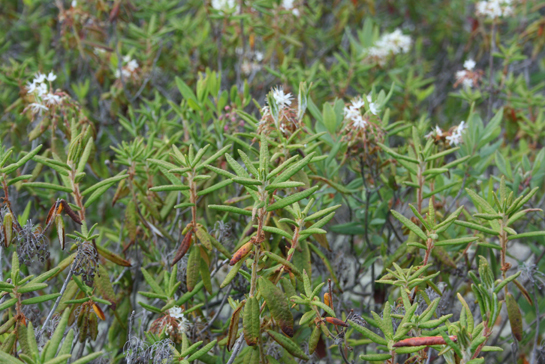 Labrador tea in full bloom. Our basic but quite fonctionnal herb drying area. A large dehumidifier helped maintain a dry air circulation. flowering yarrows. 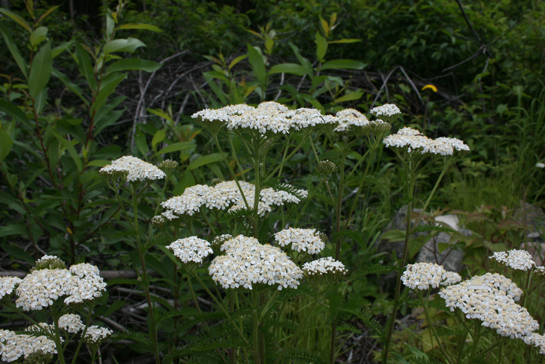 Yarrow grows well along disturbed areas like roads and paths. Visit the gruithouse.com for information on ordering gruit herbs. 47 % are medicinal or believed to have magical virtues. Their origins are essentially European. The Asian plants which arrived in 11th century Europe became widespread by the 16th century, in reduced proportions however. After the 16th century, American plants such as sassafras (aromatic and antiseptic) also made their way into beer recipes. Two ounces of any given dried herb is a good average quantity for a 5-gallon batch of beer (but of course there are plenty of exceptions). By Stephen Harrod Buhner / Used with kind permissionPERPSECTIVE : Stephen Harrod Buhner writes about our forgotten beer heritage, Gruit Ale, it’s competition with Hops, it’s prohibition and fall into oblivion. It would have been inconceivable to our ancestors that gruit could ever be forgotten. But ask anyone today what it is and a blank stare or a bad joke about gardening will be all you will get – unless for some reason you happen to ask a beer historian. But for most of European history gruit (or sometimes grut) was what beer was. If you went into a pub in the middle ages in most of continental Europe you would have been served gruit. Hopped beers came much later, gaining dominance about 1750 A.D. – though gruit ale continued to be brewed in small, out-of-the-way places until World War 2. According to Linneaus, it was used by the people of Lima in Dalecarnia, instead of hops, when they brewed for weddings: ‘. . . so that the guests become crazy.’ Linneaus called the plant galentara, ‘causing madness’, and this plant ‘which the people of Lima sometimes use in their ale stirs up the blood and makes one lose one’s balance.’. . . Yarrow is in no way innocent when mixed with ale. It has a strong odour and flavour, and well deserves the name Linnaeus gave it, to indicate the frenzy that was said to result from it. Modern scientific research has born out the fact these herbs do contain substances that are mildly narcotic, psychotropic, or inebriating. In fact, indigenous cultures throughout the world used these herbs for at least 60,000 years, not only for their medicinal actions but also as mild inebriants and sexual stimulants. To understand why hops replaced gruit it is important keep in mind the properties of gruit ale: it is highly intoxicating and aphrodisiacal when consumed in sufficient quantity. Gruit ale stimulates the mind, creates euphoria and enhances sexual drive. Hopped ale is quite different. Contemporary scientific research has conclusively demonstrated that hops contains large quantities of estrogenic and soporific compounds. In fact hops has been used for many thousands of years in traditional medical practice as a natural estrogen replacement therapy and to help insomniacs sleep. 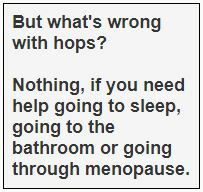 The high level of plant estrogens in hops makes hopped beer an extremely good drink for women in menopause but also makes it a very bad drink for men. Consumption by men of large levels of estrogenic compounds can lead to erection problems later in life. In fact, there is a well-known condition in England called Brewer’s Droop which is regularly contracted by bartenders and brewers after years of exposure to hopped beers and ales. Hops, when it began to be suggested for use as a primary additive to beer, was bitterly resisted – it was thought to be decidedly unhealthy as a primary ingredient in brewing. And hops’ introduction was fought through the legislatures, proclamations of the royalty, writings of the day’s medical practitioners, and through church edict. Hops, until this time, was merely one of the plants used all along in the production of beer – the earliest mention of its use probably being in Hildegard of Bingen’s (1098-1179) Physica Sacra. It finally gained herbal dominance in Germany (the first place its use was legally required) nearly the same time that Martin Luther was excommunicated by the Catholic church in 1520. This, I think, is not mere coincidence. The historical record is clear that hops’ supplantation of other herbs was primarily a reflection of Protestant irritation about “drugs” and the Catholic church in concert with competing merchants trying to break a monopoly and so increase their profits. The motivations were religious and mercantile. Reasons not so different than the ones used to illegalize marijuana in the United States in the twentieth century. That this occurred is regrettable. Though gruit herbs do possess mild inebriating activities they are actually quite healthy for people when used in moderation. Though it might seem from the descriptions of the ancient writers that gruit herbs are in the same category as what we call “drugs” today they are in fact more similar in their effects to tequila than marijuana. 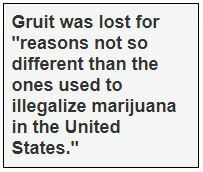 The writers who described the dangerous effects of gruit were in fact those who wanted to outlaw their use and stop the indiscriminate use of excitants (as well as make money by being able to brew a competing product). But once hops supplanted gruit the vast majority of men throughout the western world were still being drugged by their beer only now they were being drugged into a dull, flaccid sleepiness. (1) John Arnold. Origin and History of Beer and Brewing Chicago,Alumni Association of the Wahl-Henius Institute of Fermentology, 1911, p. 239, 241. 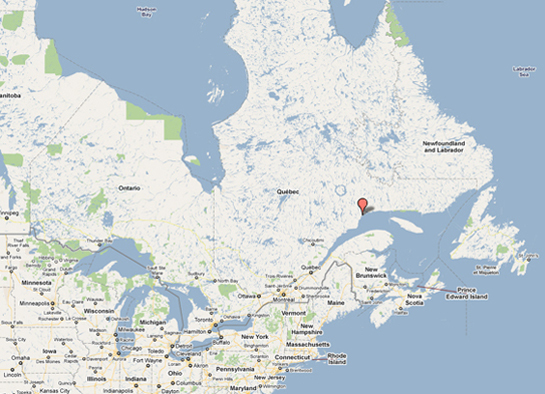 (2) Odd Nordland. Brewing and Beer Traditions in Norway, Norway:The Norwegian Research Council for Science and the Humanities, 1969, page 216. (3) Maude Grieve. A Modern Herbal, NY:Dover, 1971, page 460. (4) Nordland. Brewing and Beer Traditions in Norway, page 223. (5) Arnold. Origin and History of Beer and Brewing, page 375. (8) Nordland. Brewing and Beer Traditions in Norway, page 221.